This and That : amazing upcoming wedding events and more . . .
for something more extravagant for their big day. look no further than designer Ysa Makina. 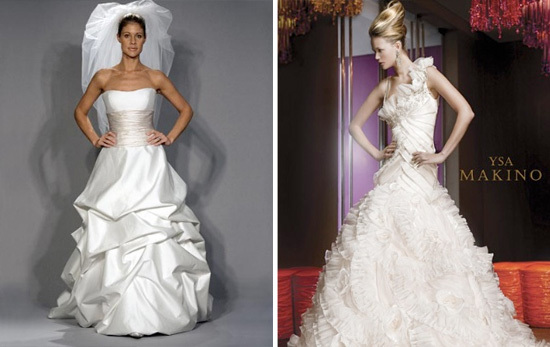 Ever elegant with European flair, dresses by Ines DiSanto will appeal to any bride-to-be. Shutterfly and Martha Stewart Weddings are getting ready to host their #Bridetobe Twitter Party on Tuesday, March 29th from 5-6pm EST/2-3pm PST to chat with other future brides and learn great tips in preparation for your big day. Martha Stewart Weddings editors can't wait to share their expert advice and Shutterfly will be giving away great prizes from their newest Wedding Cards and Stationery Collection (and more) every 3 minutes. 5Tiers.com believes that limiting the sections to the wedding necessities (Story, Photos, Wedding Day Details, Registry, Rsvps) will create for a better user experience not only for the couples, but for the guests as well. Quality and Simplicity is their mission. They also pride themselves in the tools and intuitive content management system created for the client. Editing and updating content and images has never been so sleek and easy. For the first three weeks of the site launch, you can use the promotion "launch100" to take $100 dollar off your purchase of any of the 3 pricing plans. They encourage everyone to try the risk-free trial and see for yourself the special features and tools. The Southern California Bridal District is looking for romantic, charming, and unique proposal stories to share with others. Entries can be submitted until September will be voted upon in October 2011. The entry with the most votes will receive a $200 gift certificate to Spa Finder and four runner ups will receive a $25 gift card to Sephora.